The Kerry King V2 If you are one of the hundreds of thousands of people to see Kerry King on stage with Slayer recently you have seen his Generation 2 graphics. This faithful reproduction of his latest graphics features a new two-tone tribal design floating over fire. The Kerry King V2 model is equipped with B.C.R.A. active pickups and a Kahler tremolo. It also features an ebony fingerboard, special inlay and a Beast headstock. 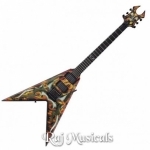 RAJ MUSICALS IS AN AUTHORIZED DEALER OF BC RICH PRODUCTS.